The Barguse Charitable Trust was established by Alistair and Lisa on 13th Feb 2011. 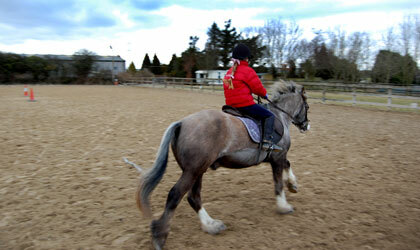 The purpose of the Charitable Trust is to provide adults and children with the opportunity to ride who would otherwise be unable to by reason of financial hardship or social circumstances; and to provide adults and children with a disability with the opportunity to ride to enable them to improve their balance, co-ordination, confidence and self-esteem. The concept of this charity was the realisation that there were a lot of children and adults who were unable to receive funding through the normal channels and who for financial/social reasons could not afford to try the sport. Horse riding is often perceived to be only for the wealthy which is a huge barrier to participation and an enormous shame as it’s such a fantastic sport. If we can give people the opportunity to have a go and show them the huge benefits that can be derived from participating then we open it to a much larger demographic which long term can only be beneficial to both equestrianism and the general community. Throughout the year we hold various fundraising events from Open Days, sponsored rides, raffles and social evenings. You can read how one lucky recipient has benefitted from applying for funding below and just why your help in raising funds is so important. In the meantime, if you feel you may be eligible for funding please contact the office for more information and an application form. A small insight into the charity’s work. As someone who had grown up in the saddle, the thought of not being able to ride hit me hard. Living as a full time carer for my husband was taking its toll on my health and emotional well-being, I was not taking care of myself and sinking ever deeper into depression, and then I was lucky enough to find Barguse. I was fortunate to be awarded a carers grant and was able to book my first riding lesson in many years. Nervously I pulled down the drive, and was welcomed with care and compassion, I was riding Charlie, who many of you will know is a true gentleman and looked after me well and was forgiving of my rustiness after many years. I was hooked, as the lesson ended I burst into tears, I realised I was where I needed to be. After talking to Shirley and explaining my situation, she was kind enough to suggest that I apply to the Barguse Charity to see if they could help fund a course of lessons for me. I filled in the form and was overwhelmed by their generosity when I was granted funding for 7 lessons. The change in me over the proceeding weeks was extraordinary; I was gaining my personality back and finally gaining some respect for myself again. My mood was becoming brighter and everybody around me was noticing the improvement. I owe all of this to the power of horses and just being around them, I owe all of this to Barguse and the Barguse charity. Fast forward a year and I am still riding every week, I have lost over 2 stone and my life is still looking bright. Even on my darkest days I know I will soon be back where I love. Thank you Barguse, you really did save me.